A new Station I made using one of Delven6's Station graphics. various of these graphics can be found at http://dvlenk6.blackraven3d.com/index.html . It is a military installation that sells and installs high military equipment and alien devices. can be found later in the game, part of the commonwealth so don't piss them off. 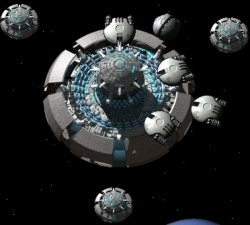 Functions like a military base but with more stuff and defense stations orbiting it. EDIT: Now re-uploaded. Changed a few functions too. 546 Downloads and no Comments. -_- Looks nice! I only like these for scenery: never docked at one: but I might add:I did notice that Super capital ships don't try to destroy it for some reason; in my game anyway; but the defense pods do get taken out. I would only like to see it a little stronger on defense, but otherwise enjoy having it in my game. Doesn't work for me. At all. This acts exactly like a Commonwealth militia fortress for me. It even gave me Rama... even though I already have him. I'd appreciate it if this mod was updated. I tried this mod (in 1.08b) and it seemed to just stop all commonwealth fortresses from spawning at all.